In 1928, an Episcopal priest knocked on the doors of the houses in Verona to find out whether there were enough Episcopalians in town to warrant the formation of an Episcopal church. Despite being hauled off in a paddy wagon for soliciting, the priest discovered that indeed a congregation should be formed. The first small group of parishioners met on the second floor of a building on the corner of Grove Avenue and Bloomfield Avenue. From there, they moved to a storefront on Bloomfield Avenue, right next to the Peckman River. Both buildings still remain. 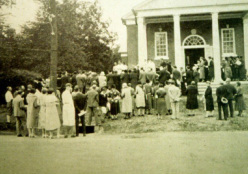 In the midst of the Great Depression, this band of bold Episcopalians decided to beat the odds and build a church. Despite tough economic times, they exceeded their monetary goals and built a little church on Gould Street, next to a field of beautiful wildflowers. The original structure matched the style of the buildings on the Town Square and was dedicated in 1932. The Church of the Holy Spirit was born. During World War II, more than half of the men – and some of the women – marched off to join the service. When the Baby Boom hit Verona, the little church outgrew its small footprint and children attended Sunday School across the street at H.B. Whitehorne School. The congregation embarked on another building campaign and erected a new sanctuary that was dedicated in 1963. The original chapel still remains – a peaceful and beautiful reminder of Holy Spirit’s history. Make sure you stop in to see it when you visit the Church of the Holy Spirit. Since its inauspicious beginning many years ago, many people have made the Episcopal Church of the Holy Spirit their spiritual home. Today, we are proud to be known as an open, welcoming, and inclusive congregation ... one where "everyone knows your name." Read about Holy Spirit Verona's connection to the HBO's television series The Sopranos on myVeronaNJ.